Taylor and Garrett knew that it was meant to be from the very beginning! After only dating for a few months, Garrett decided that Taylor was going to be his life-long love and decided to propose to her at The Haven, which is located right in Charlottesville. With The Haven playing such an important part in their love story, they decided to have their ceremony there on October 14, 2018, and then afterwards, departed to Keswick Vineyards to kick off the night! As Taylor and Garrett arrived at Keswick Vineyards as a married couple in their vintage car, guests also arrived to partake in their celebration! With the silk beige linens, lanterns, hints of blush and burgundy, and the candles that were placed throughout the tent, the reception couldn’t be more charming! We also loved the seating chart, which were white, calligraphed window panels. Everything was decorated so beautifully, and guests were in such “awe” of the romantic wedding. Guests also couldn’t get enough of the “Mr.” and “Mrs.” game that their DJ played with the couple. While the couple faces back-to-back on the center of the dance floor, the DJ asks the couple a series of questions. 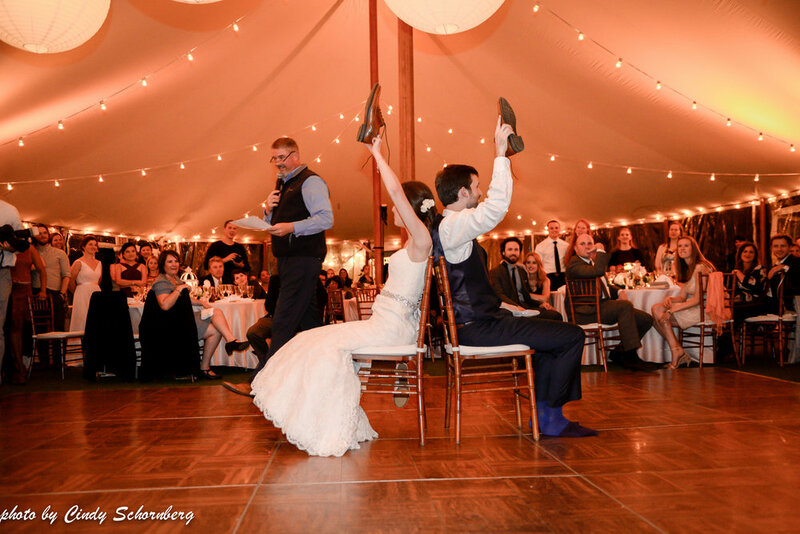 The couple has to either raise their shoe or their partner’s shoe to state who relates to the question more. Amongst these questions are ones, such as, “who is the messiest person,” or “who said I love you first.” It was hilarious seeing everyone’s reactions and even more fun seeing the couple’s answers to the questions. For the remainder of the night, guests were able to “dance the night away” and enjoy the beautiful cake and cupcakes that Taylor’s Aunt made for the couple’s wedding day. It was, truly, the perfect night. Congratulations, Taylor and Garrett! We hope you enjoy your life as a married couple! Event Planner: Barb Wired, Caterer: L’etoile, Desserts: Susan Haisley, DJ: TD Layman, Photographer: Jeff Gleason, Videographer: Stephen Stonestreet, Hair and Makeup Artist: Jeanne Cusick, Florist: Mary Henry, Transportation: Albemarle Limousine and Camryn Limousine, Rentals: MS Events, Lighting: Skyline Tent Company, Nannies: The Nanny Network.